Whether purchasing and installing a single tool, expanding an existing fab, or building a full clean room facility, MCB has experience to help guide you through the process to make the right decisions for your situation. For full builds, we will guide you from concept through fab design, layout, facilities and supporting infrastructure, including fab construction, equipment selection and installation, and equipment operation. Support systems, such as gas distribution, toxic gas monitoring, chemical handling and storage, waste treatment and disposal, DI water, air handling, are all systems that we can provide assistance. We can interface with your A&E and construction firms to provide alternative design and construction options for best value. 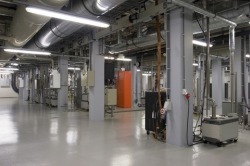 Finally, we can develop the protocols to maintain your clean room facility on an on-going basis. Avoid costly mistakes and time-consuming errors by good planning, comparative analyses, and a participative process. While this may sound like "motherhood and apple-pie", there is real impact to the budget and schedule when the plan changes during construction. The cost of these changes are compounded by the cost to "un-do" construction already completed to accommodate the change. Money spent on up-front planning pays off! Before you even reach the equipment purchase decision, we can help you determine the various process options by review of the overall device fabrication scheme, or of the specific deposition and patterning methods. Once the decision to buy has been made, we will proceed through the competitive bid process, defining the specifications, performing the side-by-side evaluations, negotiating with the vendors as your partner, completing the required purchasing documentation, assisting in the installation, qualification, to final setup and operation of complex toolsets.